Though no one has ever probably characterized Jimmy Stewart as a badass, his performances in these Mann Westerns are certainly the most uncannily close the actor has gotten to achieving true badassery. Mann uses Stewart's well-known persona to explore the untapped angst and roiling anger that lurks in the heart of many an average Joe. This is exempified by a tracking shot of Stewart about twenty minutes or so into the film. In the lead-up to this shot, Stewart's character Will Lockhart has successfully brought a load of goods through Apache country into Cornonado, New Mexico. He makes his delivery to the eye-catching Barbara Waggoman (Cathy O'Donnell, They Live By Night), who tells him about some nearby salt with which he can fill his wagons, so he won't be empty on the way home. Only... a couple things get in the way before Will can leave. He notices a repeating rifle in the shop that he learns was traded in by an Apache: a clue that might draw him closer to exacting his revenge. But, more pressingly, he and his men get ambushed when they try to dig up that salt. Dave Waggoman (Alex Nicol), Barbara's petulant, hot-headed cousin, claims Will and his men are poaching on his father Alec Waggoman's property. Rather than let them off with a warning, Dave has one of his men lasso Will, drag him through a campfire, and then make him watch as his wagons are burned and his mules are shot. If it sounds brutal just in the written description, Mann doesn't dull any of that brutality with his blunt staging of this unthinking cruelty committed by Dave and his men. Although Alec's right hand man Vic (Arthur Kennedy, High Sierra) shows up to keep Dave from killing every last mule, and later the senior Waggoman (Donald Crisp, How Green Was My Valley) offers to reimburse Will for what Dave demolished, it's not enough to keep our hero from sticking around Coronado. For one thing, he has to find out if someone at Waggoman's Barb ranch has been selling repeating rifles to the Indians. You see, one of those rifles was used by Apaches to slaughter Will's younger brother and a number of his brother's soldier comrades on a routine patrol. Will figures that whoever sold that rifle is as guilty as the man who shot it. We the audience don't have all those details about Will laid out for us yet when Mann unleashes that tracking shot I referred to before. We sure get a sense of them, though. Will sees Dave and his men on horseback in town shortly after they've wrecked his livelihood. Mann keeps the camera focused squarely on Stewart as his character walks across the town square to confront his misguided tormentor. As the camera tracks back with Will, we see the mixture of frustration for what Dave did and righteous anger at what Dave might have done gradually building as Will steadily closes the distance, flexing his hands, just aching to slug the jerk. When Will reaches Dave and throws him off his horse, that stylistic steadiness of the camera is replaced by a sloppy, inelegant brawl. Though Mann has often shown himself to be an expert stylist, he doesn't overly choreograph the scuffles and gunfights in this film, allowing the violence to be ordinary, ugly and painful. In a later scene, Dave has his men hold Will tight so he can inflict his own twisted revenge, and the moment is excruciating. But The Man from Laramie isn't memorable just for its machismo and brutality. The script by Frank Burt and Philip Yordan, the latter of whom worked on the similarly operatic Johnny Guitar, is intricate and satisfyingly constructed. It delicately reveals the interwoven relationships of the characters within this small town, complete with the weaknesses that are bound to give before all of this is over. Will is smitten with the shopkeeper Barbara Waggoman, but she's involved with Vic. Vic figures they'll be able to get married once he inherits the Barb ranch from Alec Waggoman, even though he isn't Alec's kin. Dave, who is Alec's kin of course, doesn't understand the cattle business and is jealous of his father's affection for Vic. Meanwhile, watching from the outside is Kate Canady (Aline MacMahon), a former flame of the old man's who wouldn't mind taking a piece of his ranch for herself. If it all sounds a bit soapy, it doesn't play that way onscreen. A few stiff moments aside, the cast brings an emotional gravity to the material that elevates it to high tragedy. Fatal flaws combine with unfortunate circumstances and everything just crumbles. Mann and his writers don't go fully Shakespearean -- everyone doesn't die and the ending is hopeful (yet wistful) -- but there's a surprising cumulative power to The Man from Laramie that puts this film head and shoulders over your typical oater. As with almost all of Twilight Time's releases, The Man from Laramie has been issued in a limited edition of 3000 copies. Charles Lang's gorgeous, incredibly wide CinemaScope photography is wonderfully presented in this AVC-encoded 1080p 2.55:1 transfer. The image is pretty much free of dirt and damage, and the film grain has thankfully not been scrubbed away. The Technicolor is vivid and consistent. The level of fine detail is excellent. Some of the night scenes shot using a day-for-night process read as a little too murky, but that presumably was the case with the original film and does not seem to be the fault of the transfer. Isolated music and effects track - Another Twilight Time release, another M&E track. I enjoyed George Duning's score, so it's pretty cool to have it in this uncompressed stereo mix -- even with the sound effects still in there. Trailers - There's a "teaser" that runs under a minute, and a longer "theatrical trailer." Both of them hammer home this story's origin as a popular Saturday Evening Post story, and both of them are surprisingly spoiler-y. 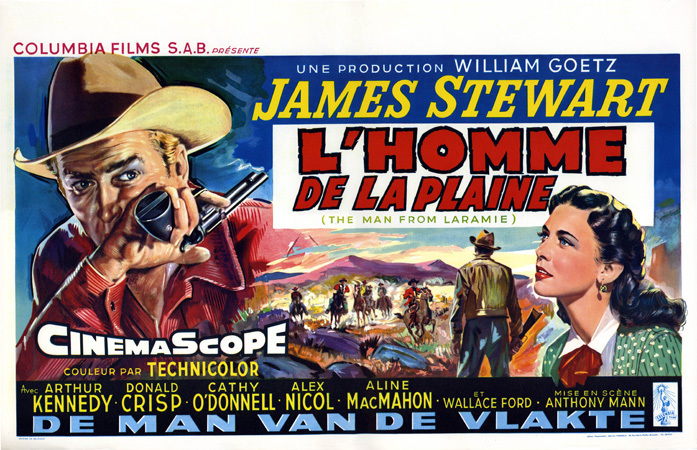 This disc offers a gorgeous-looking transfer of a landmark collaboration between star James Stewart and director Anthony Mann. Highly recommended.